The only required field on the Edit Detail screen is the task Name. All other options are optional. Name The name of the task that will appear in the Request Detail for any request of this process. Description/Notes Internal notes for Process Administrators. These notes are not visible to end user of the process. By selecting this option, Integrify will automatically create a business rule to the End Process task when this task completes. The same configuration could also be made manually by accessing the Configure Rules option for the End Process task. When This task completes, set the following milestone Selecting this option activates Integrify's built-in milestone/status option for the task. The current status of the request will be set to the value in the text box provided upon completion of the task. Exclude this task from Request Detail This option will completely hide any of the task information from the Request Detail of a request. Typically used on autonomous system tasks such as a DB Push, DB Pull, etc. Data from this task will be expanded in Request Detail The Request Detail will be automatically expanded to display all of the relevant information for the task. 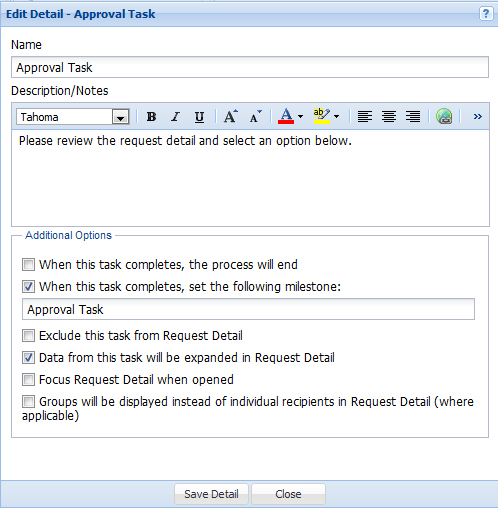 If the task is a Form task, all of the submitted form data will be displayed, on an approval task the option the user selected will be displayed, etc. Focus Request Detail when opened Selecting this box will force display of the Request Detail tab when a task recipient opens their task in their email notification (as opposed to the default of directing them to their open task tab). Groups will be displayed instead of individual recipients in Request Detail (where applicable) Selecting this box will force display of the group same instead of individual recipients in the Request Detail. This is useful if it is not desirable for other recipients within a request to know who is actually being assigned to other tasks.